I've been a Sugarpill customer since almost the beginning! My very first "real" makeup palettes were from Sugarpill and I've been a fan ever since. They recently re-released the adorable Trinket as a permanent shade along with Kim Chi's liquid lipstick. But, it seems like Amy and her team have been working forever on bullet lipsticks. I remember seeing Nurse forever ago on their Instagram and just dying for it to be released somewhere besides IMATS! Many, many thanks to Sugarpill for gifting me these lipsticks. I am ever so thankful and I have so many ideas running through my head on what to do with these babies. Those of you that have been following me for a while know I love just covering my face (and body) with makeup. Introducing Sugarpill's Pretty Poison collection! These are six unique shades that range from classic to unconventional in a long-wearing, hyper-pigmented matte formula with single-stroke coverage and a sweet creamsicle scent. These beauties launch this Monday, Nov 14, at noon PST. Sugarpill has some of the most pigmented, buttery eyeshadows on the market, so why would their lipsticks be any different? These are very opaque and so smooth and buttery. If you've played with a lot of brightly coloured lipsticks, you'll notice that the most vivid ones are always a little harder/more dry to apply or you need many, many coats to make them as bright as they look in the tube--these are not like that. One swipe and you have full colour. They are easy to apply and don't feel drying at all. The creamsicle scent isn't overpowering. In fact, it's hardly noticeable. These beautiful lipsticks come in a little sugar pill tube that's covered in sparkles. Their net weight is 3.2 grams and they will cost $20 each or $120 for the bundle. They are also vegan and cruelty free! Now, for the swatches. These were swatched on dry, bare skin. No primer or base was used. NURSE: Rich, matte, true red with blue undertones. DETOX: Delicious, revitalizing orange. Very true-to-colour. 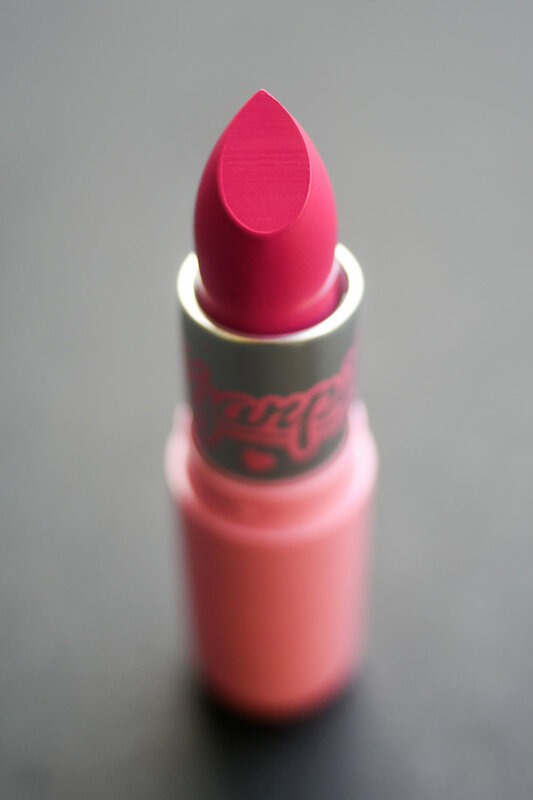 GIRL CRUSH: Vivid, matte fuchsia with blue undertones. U4EA: Super saturated, darkened matte teal. If you'd like to see these on a darker skin tone, @makeupbykrishna swatched them on her page AND in Sugarpill's very FIRST Youtube video (Finally!) You can watch it down below or click through to their Youtube. Autumn and Krishna live swatch the lipsticks! ***To maintain transparency, I want to let you know that this blog post is not sponsored. My opinions are my own and are truthful. However, these lipsticks were graciously gifted to me by the Sugarpill team.